Their hearts filled with gratitude. The feeling in my chest is definitely not related sadness, pain or hurt. It’s you know…like when you see something…formidable happening…! One clutches one’s chest, there’s a kind of hushed feeling of…WOW…! 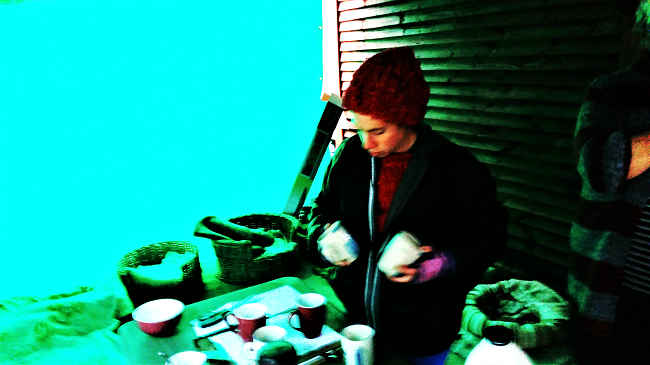 And the ladies who supply the delectable foods: coffee & tea etc for the ‘workers’. Keeps us going! Steri Day Saturday 16th March - 12 sterilisations carried out - see REPORT and Breakdown of monthly calls. Steri day 19 January 2019. Early start 6.50 due to some kids bringing their pup for a deworm and vac. All set up two cats made it first to the table. 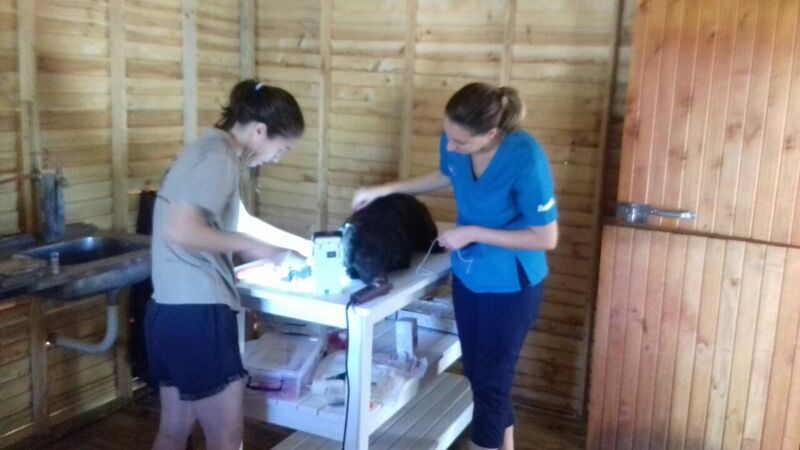 Marianne’s first proper spay day with us, accompanied by the rest of the team. All cats and dog were all in relatively good condition – the biggest challenge being fleas and some carrying ticks. Helen kindly provided zero spot on that was put on all the dogs. Some animals were in need of deworming – this accompanied the food given out when returning the animals. We were pleasantly surprised with the mild temperature of the day and a slight gentle breeze kept the awaiting animals cool. Lovely snacks – fruit salad, freshly baked flat bread and savoury tart followed by lovely crunchies and lemon cake with hot drinks, also Li provided us with some ice tea. THANKs to all. 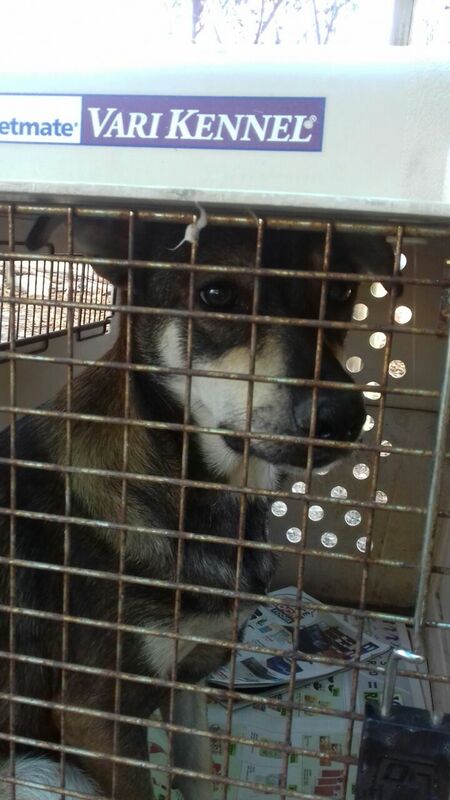 Some of the animals that were booked for today (3) were not done and will be carried over until next spay day. This was a decision taken whilst collecting dogs in Piet October Sgl, we were mobbed by a few owners – a beautiful seal point kitty with kittens that were half dying due to mothers lack of food – kittens were euthanased and mother was taken Immediately for spay, a dog that also had older puppies crawling in fleas and ticks was also taken in. These we believe superceded the ones booked. We are planning to have the next spay day just removing and spaying dogs n cats in P.Oct Sgl and giving them both endo and ecto parasite medication. 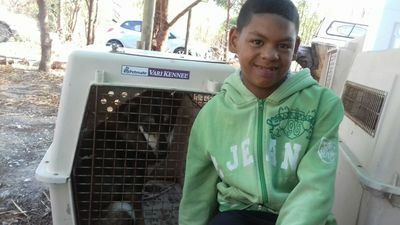 A big thank you to Juanita/donkey sanctuary for the standby generator for electrical back up. This is just to remind you that the MySchool MyVillage MyPlanet 21st Birthday Promotion is still open until the end of February. There were a few challenges presented, shortly before the day, but all went accordingly, albeit not a particularly rushed day & effective nonetheless. Not being able to get to the farm where we were collecting the steris beforehand meant that some dogs and the cats were AWOL on the day. 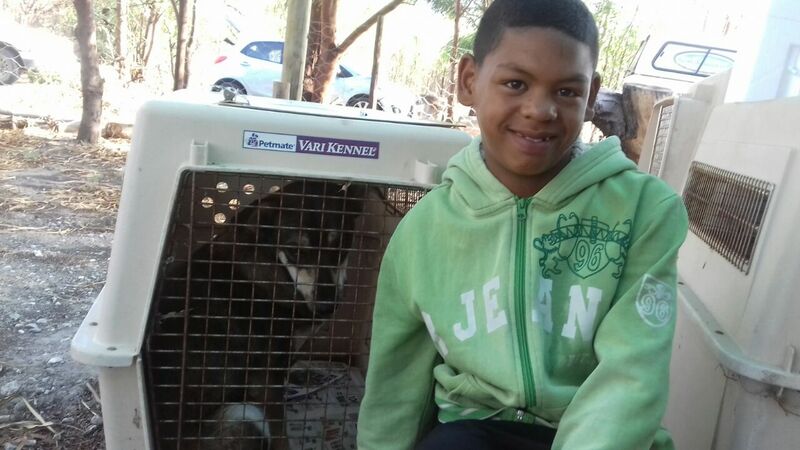 We have completed most of Francois Naude's workers' animals – 2 cats and a dog left for next spay day. All operations carried out without any major problems and returned to owners. The donated solar unit worked well we will now place on the roof for the next steri day. The new shadecloth area has been erected and purlines have been placed in preparation for the extended roofed area. This will be completed prior to the next steri day . Some dogs had many ticks, fleas etc and those were treated with spot on. 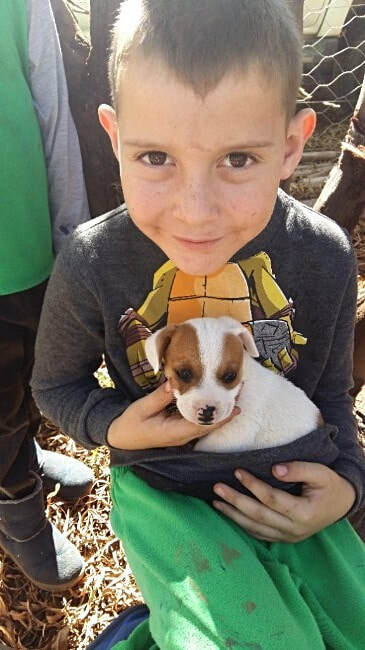 Champagne donated by Myrna Robins toasted the 100th spay a little Jack Russel, this has set the annual target – no less than a 100. 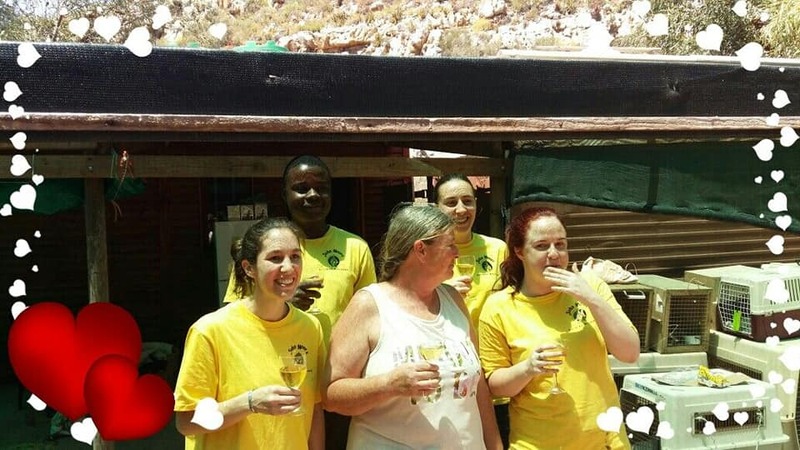 Snacks and wine prepared by Anne Binos, Janet Forrester and Monique Van Wyk were delicious and added to the 100th spay, end of year celebrations and of course the farewell to Melissa. Melissa will be sorely missed, and certainly, for me personally, and I’m sure speaking for all, it has been so terrific working with her and we all wish her the very best with her new ventures. 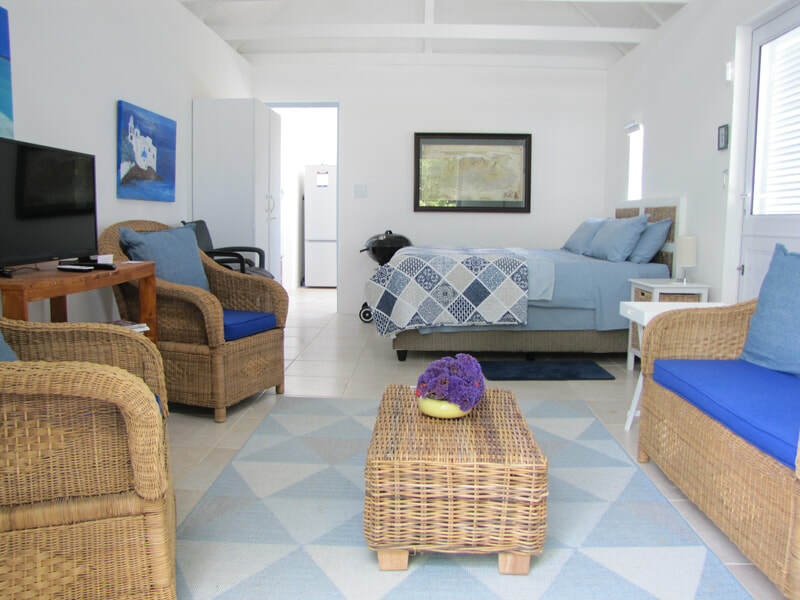 We have rectified some small issues – some plumbing and septic tank problem. We have started to plant some trees to allow for the future cutting of the port jacksons. Our next steri day will be in about the 19th January, with the new CCS vet, so we wish all volunteers and donors a festive Christmas and prosperous New Year. From Del Jones - Hi everyone. The year is closing and all I can say is THANK YOU. To all that have helped make this such a success and enjoyable with it. 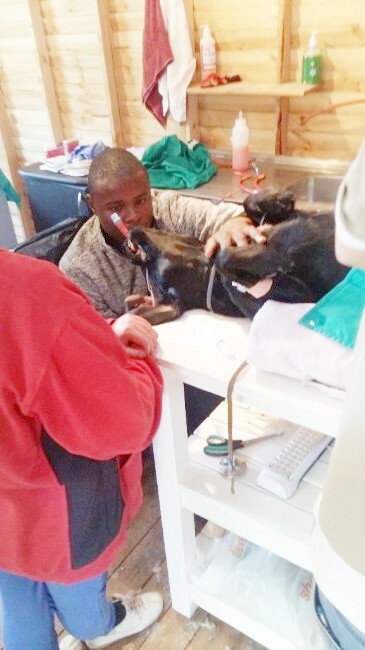 Happy to say we end the year with 104 sterilisations, and we will achieve the same next year. What an achievement, well done everyone! Melissa, all the best and enjoy your next chapter. Help us make it 200!! See what CARE does : donations gratefully accepted towards running costs! Emergencies 24/7, after hour calls for the community, dipping services, clinics, advice, humane slaughter etc. Flight Centre - there is a branch in Mountain Mill Mall, Worcester. Steri day Sunday September 2nd 2018. This particular spay day had been postponed twice due to certain issues hence why was on a Sunday – out of the ordinary. The weather although welcomed could have been better timed – the rain set in early morning and continued up until the last operation was finished – that did not dampen anybody’s spirits – although put a few volunteers off. First 3 patients were collected at 7:30 and set up started at just after 8 followed by collection teams at 9 ish. Working in the rain with limited covered area proved to be a challenge that was overcome and all carried out their duties drenched but in good spirits. Theatre list was followed with one sick dog and a neuter with cherry eye taken back to Cornerstone to be diagnosed and operated on at the surgery. Last surgery completed at 13:50 all animals were returned home by 14:30 - everything completed and tidied and packed by 15:00. 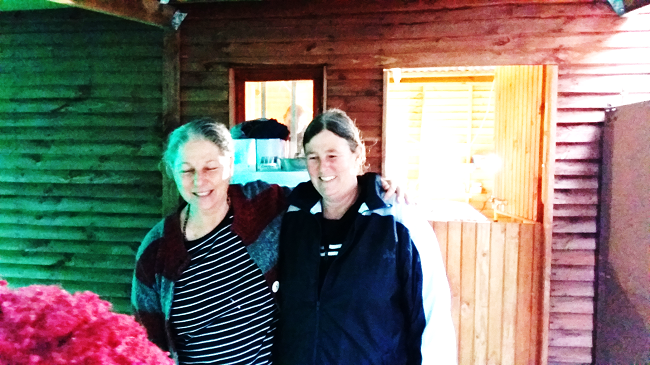 Lovely soup and freshly baked homemade bread and lovely crunchies accompanied hot drinks – mostly hot chocolate were all delish and very welcome in the cold and wet weather. THANKs to all. Small but efficient team and braved the weather with such great attitudes. Many challenges presented, created by the weather, just taken in the stride. Ernest Bloukamp allowed us usage of his gazebo which was indispensable in the end. We will continue with the farm dogs on the next day. Big thanks to everyone and we will see you at the next spay day – dry day hopefully. Again we have decided, due to shorter daylight hours and cooler temperatures, that it is more beneficial to both animals and staff to make hours from 8am to 2pm. 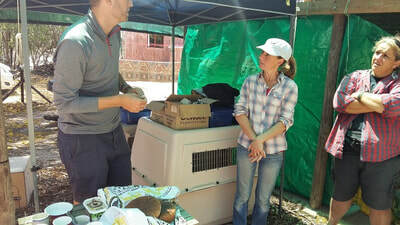 A good, effective, efficient day and well supported - animals were collected mainly from White City and farm workers at Francois Naude’s farm. Marlene and I did some prep work on the Friday - we set up the tarps to act as walls to stem the forecast cold weather - this worked well and we really need another tarp sheet for the other wall. We arrived on site at 07.30 with the first 3 patients, to set up. Vet teams arrived 08.15, and support teams thereafter. We performed all ops as per our theatre list - unfortunately one dog didn't recover from anaesthetic - a post mortem was performed. 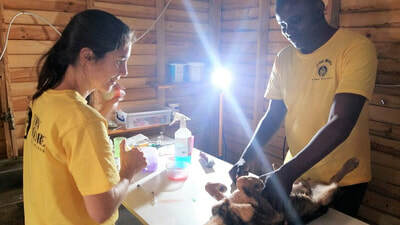 12 rabies and 7 vaccines were administered and all animals dewormed. Every animal was returned with a parcel of food. Last surgery completed at 14.25. Again the refreshment teams were fabulous; wholesome soup, homemade bread and lovely cake and crunchies - tea, coffee and hot chocolate. A small solar system has been offered so I will check this out during the coming week and hopefully set up before next date. It's so nice to see our assets growing; our spay sets, the tarps, our new clippers - all being put to work making the operation more efficient. As we grow so our needs also grow - now the winter days are darker, we are in desperate need of better inside lighting. Stef is going to research prices and see if we can find a kind donor. Other items are always in need of are - blankets, towels, sponges etc. 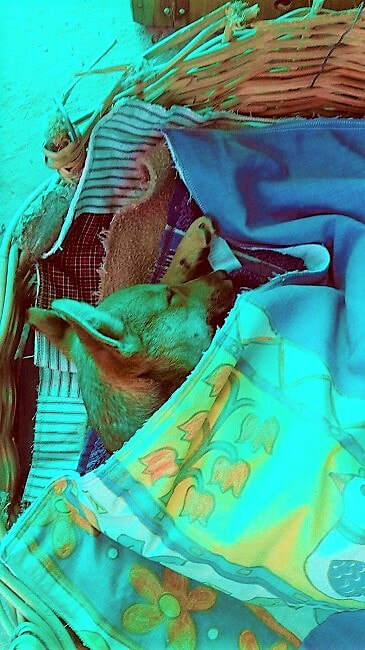 We use our recovery blankets to keep the animals warm after anaesthetics – while more donated towels and blankets are left with some of the more needy animals on their return home. CLICK HERE - we will arrange collection of any donations. The decision, originally, was to have a full spay day every sort of 6 weeks. We had carried out a full day 4 weeks back, but as Del Jones was going on leave on 20 May it was decided to have a half day spay day to bring the time lapse a little closer before the next spay event. Again another good turnout, well supported and each time we are becoming more efficient and effective. We had two collection and return teams and approx. 4 support persons. Arrived on site to set up 07h30, vet teams on site for 08h00 and collection teams on site for 08h30 – 09h00, this staggered start works very well and allows for efficient utilisation of peoples time. 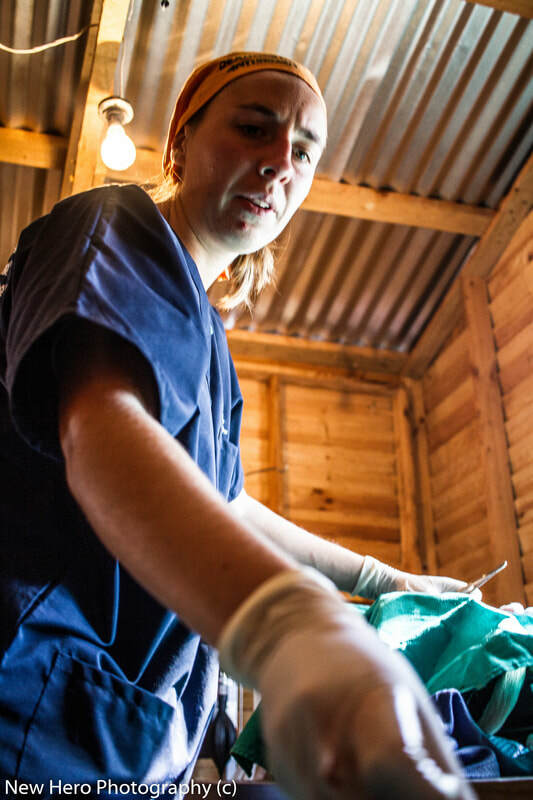 Del brought the first 3 sterilisations with her whilst setting up to allow vet teams to start without any delay. We had no deviations or treatments to the theatre list and all went smoothly without problems. 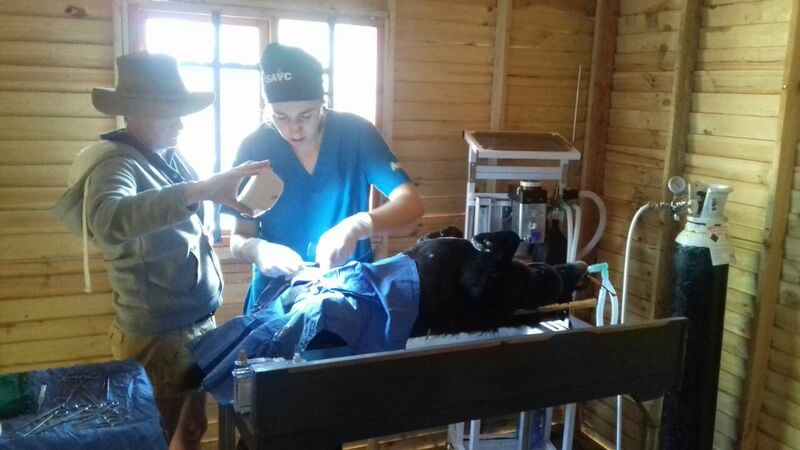 Final surgery was completed at 12:45 and last animals were returned at 13:30, everything completed – cleaning, packing and tidying up by 14h00. The refreshment team again went the full mile and everybody had their fill of food both savoury and sweet. Thank you gals. Again a good working team and the atmosphere so relaxed making it a pleasure, not a chore. Big thank you to Cornerstone again for their equipment and time – although this time we christened our own spay sets. The tarps have been purchased and are available for those chilly days when warmer areas are needed. We have been offered a small solar system for the area which will be of tremendous use – Del will collect and set up on her return from leave. We have purchased our own clippers they will arrive for the next spay day so all in all we are improving all the time – and that will be seen in the numbers at the end of the day – fantastic! We are looking into the idea of bringing in animals from the local farms at our next spay day. Meetings will be set up and hopefully go ahead. So a big thank you to all and will see you for the next day in approx. 6 weeks. And the winner of the beautiful, hand-made throw raffle is Mira Weiner! Thanks to all who supported our fund-raising effort! ​with Li Deegan who sold the tickets at the Saturday morning market. THE PEOPLE WHO MADE IT HAPPEN! A great day, well supported and much achieved. We split the collection teams into two shifts one shift 8 – 14h00 and the second team 12 – 1700 – thank you to all ! We were, in fact, quite top heavy with people and some were able to leave earlier which is great - I will be more streamlined in organising the next one. All met at venue at 8am - some a little earlier which is always good – all set up in the theatre and prep area first; a little cat neuter on the table - bright ‘n early. Unfortunately there was a little time lapse due to a goat that wasn’t playing the game as far as castration goes. 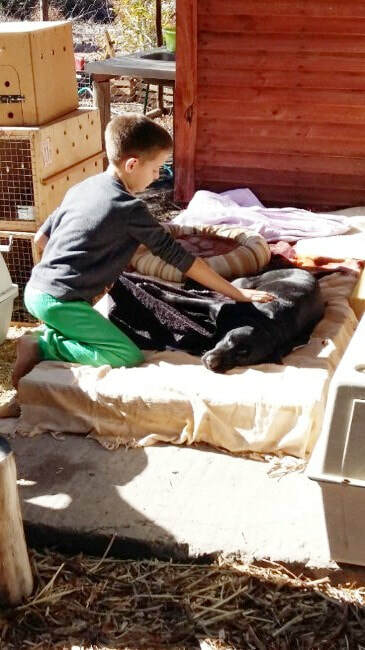 After that all went to plan – Helen Tiffin consulted the 2 week old blind foal, the was a little pup treated for biliary (was nursed overnight but unfortunately died Sunday afternoon), some dogs treated for parasites, most animals vaccinated and all sent home with a small bag of food. One of the sterilised cats also had to have a partial tail amputation. Last dog on the table was pregnant. 19 spays & 6 neuters - AWESOME! Last animals were returned at approx. 5.45pm and after a little cleaning up all completed for 6pm. The refreshment girls outdid themselves – such a spread was available – thank you – was quite a task to keep the members working with such temptations. Great atmosphere, overwhelming support – good interaction and work ethic. Again a huge thank you to Cornerstone Veterinary Services for use of their equipment and machinery - without it all would be impossible. The next one will be starting to see lower temperatures – so more focus on morning coffee for the people also we will purchase 2 tarps to enclose the front recovery area to stem any winds. Thank you and we will see you all in about 6 weeks – A BIG THANK YOU TO ALL. Del has worked Saturdays at times with a small team of men – this entailed throwing a slab, clearing and cutting or trimming, erecting a roof over recovery, putting up a fence tidying, clearing and plumbing. A lot of painting of the ablution area was completed. Some donations in physical form – shadecloth, etc have been received as well as money towards the project. Marlen has assisted a great deal fetching and carrying and organising workers. Both Del and Marlen have donated poles, gates, wire, toilet, use of machinery and tools. All of this resulted in our first test drive on the 21st February which was so well supported – volunteers fetched and carried animals, helped in prepping for surgery, a few glitches were overcome and the day was a great success thank you to all. 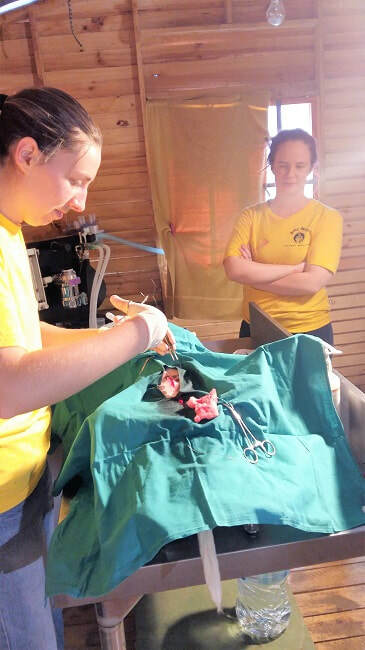 A total of 14 dogs were sterilised with a couple of small procedures performed as well. The next spay day set for 7 April. 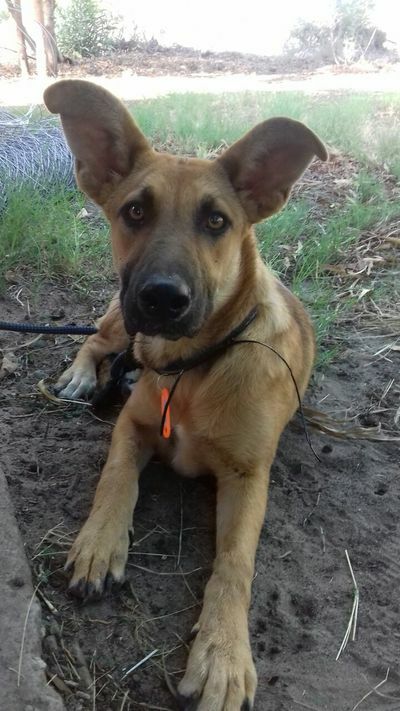 Summer therefore biliary and erlichia cases very apparent – dipping was stressed and owners told to be vigilant in prompt dipping times, even if they don’t see Japie when he is in the streets performing dipping they must go and buy dip from Japie. From November saw the moving in of residents to White city – this posed great problems with reports of owners leaving dogs behind at their own premises and also the fact that no fences were erected at the new premises – meant that dogs were now being placed on short chains or running loose in the streets. Towards the end of January this started to improve with owners putting up fences – much work to be done in the new area – many new dogs being brought in from outer lying areas – not sterilised, not vaccinated introducing new diseases. During this period especially Jan/Feb we attended to many scorpion stings (similar to the amount in 2016) some very bad and had to be taken to the vet and either put under anaesthetic or treated with anti serum, others more fortunate were treated and pain managed at home. A few fatal snake bites reported, none treated and very few call outs to relocate snakes – compared to last year. We have had a great number of collars and leads donated to us and they have been handed out to the community and this is reflected in the increase in the number of animals seen being walked on leads – which is most encouraging. With the moving and celebrations of new housing in the village has also caused a new set of problems with noise and fireworks this results in dogs injuring themselves or running in the roads and being knocked over – the police and the noise department/by law enforcement have welcomed complaints and they will follow up on these complaints. On a brighter lighter note we have in this time successfully managed to rehome an adult cat, 2 kittens and a dog. We have had great support from the community regarding the steri unit – Bridget has mastered the making of recovery blankets and many towels & blankets have been donated which is fantastic - this unit will be an ongoing service every 6 weeks. 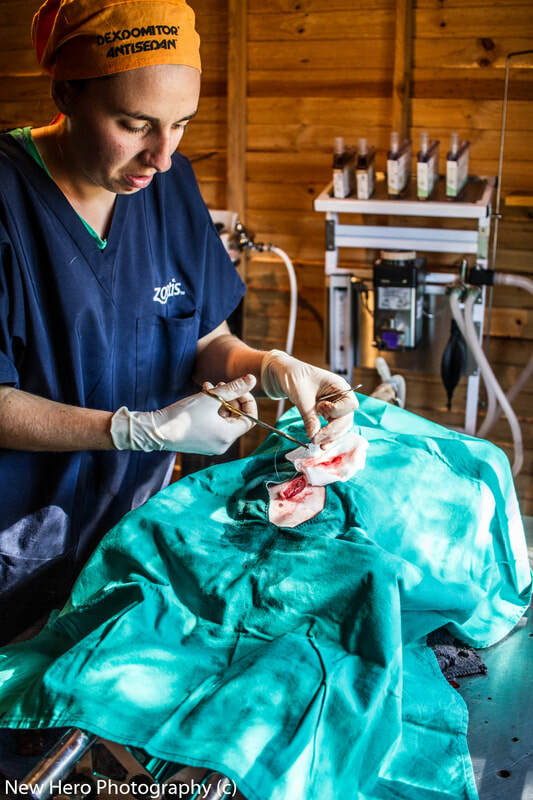 Every sterilisation patient goes home with a packet of food - this is to aid the body especially the liver to process the anaesthetic in the body, so if you are looking to assist the animals this is a guaranteed way of doing so – any donations of food are welcome. Many thanks for the support we have received! Another warm weekend in the village. The Saturday market was buzzing, tourists thronged the main street, and the hills were alive with bikers and hikers. At the base of the Krans, in a patch of cleared alien vegetation on a small farm, a wooden wendy house with extensions was the scene of much activity. 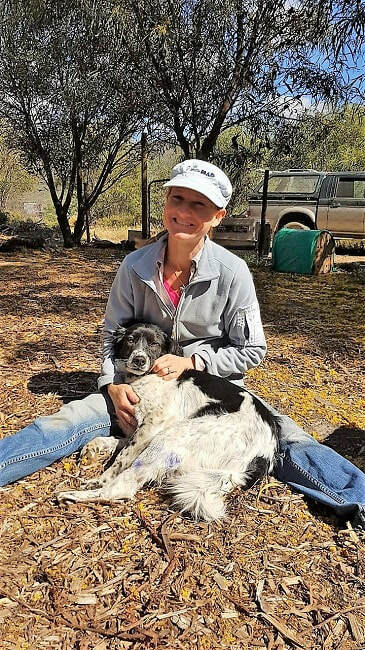 Inside Dr Melissa Sussen bent over a stainless steel table brightly lit, stitched up the dog she had just spayed. In the other half of the cramped space Dr Helen McClean brought in the next patient, a dog for neutering, who had had his premed. 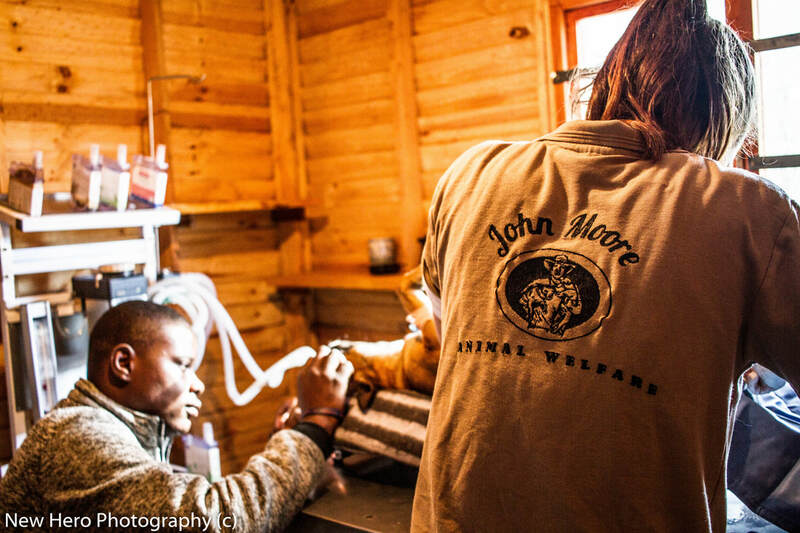 Two volunteers were helping, prepping and with aftercare, while outside others soothed dogs in kennels awaiting their ops and petted those who were coming round from their anaesthetic. Young Jermaine and his two pals hung around, prepared to do whatever task they were assigned as more vehicles arrived with resigned pets wondering what was ahead of this unusual outing. 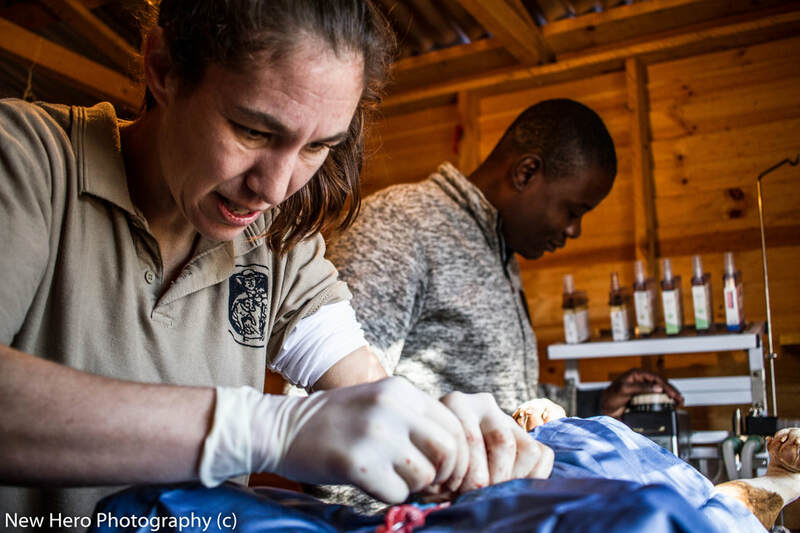 Action on the first Sterilisation Day at the McGregor Animal Outreach Unit progressed smoothly and efficiently, in a relaxed but vigilant atmosphere - where the four-legged patients were the VIP’s. Some eight hours later a tired team, headed by Del Jones, and consisting of two vets and one dozen volunteers, were packing up after cleaning the unit. 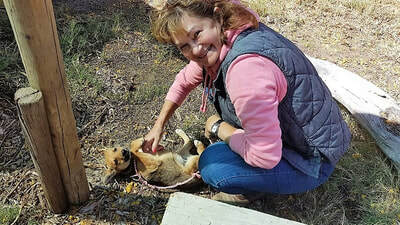 Seven animals were spayed, another seven neutered, various treatments for allergies, ticks and erlichia had been meted out and two large porcupine quills removed from one dog. The initiative started by Del Jones - who is well known to every pet owner in the village and surrounding farms - has been named McGregor Animal Outreach Unit, and the venue is on her property. Del, who, as many of us know, is responsible for all the veterinary care afforded to pets and livestock on behalf of both CARE and WAR. We are also impressed that she keeps smiling even when contacted before 6am in the morning and up to midnight by locals to come and attend to their sick animals. 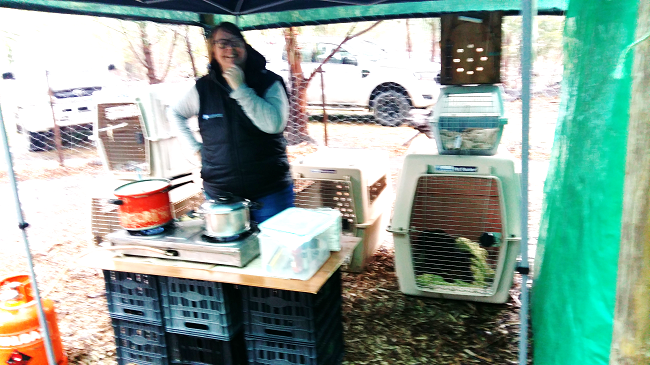 McGregor is so fortunate to have someone like her who – in spite of occasional abuse by animal owners – never hesitates in her dedication – now evident in this new unit to encourage owners to sterilise pets and help limit neglected and unwanted offspring. The Outreach unit has become a reality thanks to funds from CARE – Care for Animal Rights and Environment – and other donors. Dr Helen McClean has registered a Community Veterinary Clinic at the Vet Council, which sponsors animal outreach education. 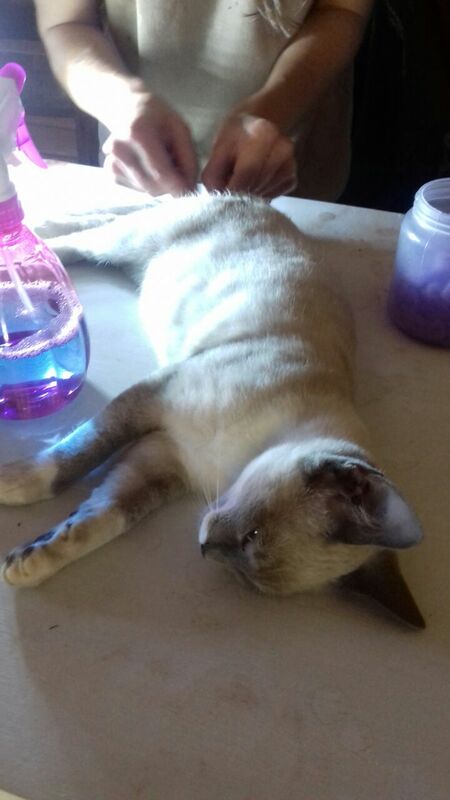 She is doing the sterilisation operations free of charge for the new Unit, while the drugs are paid for by CARE. Dr Melissa Sussens is a recent graduate who is doing her CCS (Compulsory Community Service) year under Helen McClean’s direction. 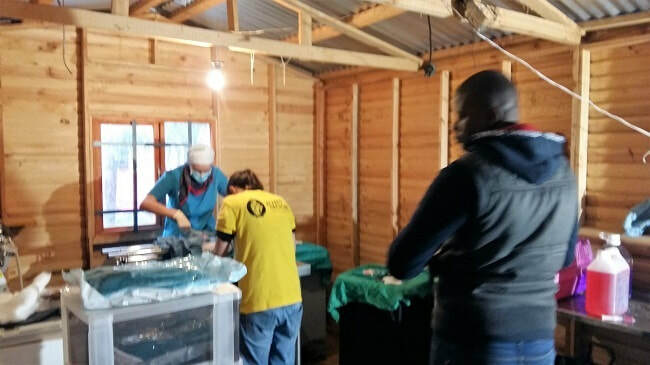 Del Jones, with friends and residents, especially Marlen van wyk and Pat Warren, have spent many weekends building and equipping the clinic. 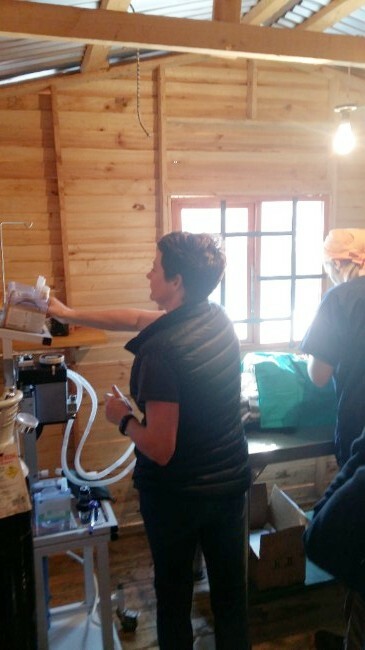 Now that it is operating, while we applaud the dedication and enthusiasm of all involved, we need to reflect on just how much work is involved in a Spay Day. Long before the first animals can be collected, the unit has to be cleaned, instruments sterilised, drugs and medication got ready. Rechargeable lighting is required for the operations. Clean blankets are needed for the recovery “ward” (in the shade outside the wendy house) And, of course, after the last animal has been taken home, everything has to be packed up and cleaned before the team can go home. The eight-hour day on the farm is just the central execution of so many more! ​Del, on reflecting on the first operational day of her enterprise, remarked that next time she needs another steel table, must collect more “lappies” and will organise refreshments and sandwiches for everyone. She hopes to hold sterilisation clinics regularly on a monthly or six-weekly basis. She thanked all who helped make the opening day a success, and hopes that pet owners will contribute what they can to the service. 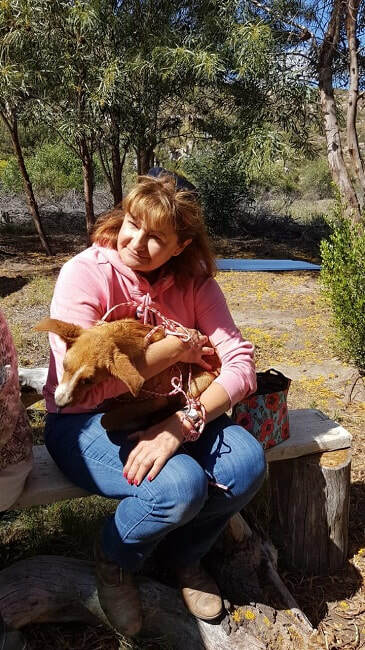 Along with Del and Drs McClean and Sussens, the volunteer team comprised Marlen van Wyk, Elana van der Colf, Pat Warren, Stephanie Taljaard, Juanita Zimmerman, Isabel Menzies, Jermaine, and Margie and Li Deegan. A toast to all from us and all our four-legged friends. ​A reminder - donations are gratefully received. PLEASE MARK DONATIONS CLEARLY WITH YOUR NAME AND CONTACT DETAILS as receipts must be issued in accordance with our PBO status. ​Selling and setting off any fireworks including smaller crackers etc is illegal without a legal permit authorising a person or business to do so. There have been many complaints recently regarding fireworks being set off in the village this is a fire hazard, it is disturbing to the neighbours / community and poses a huge threat to the animals in the neighbourhood that can lead to cruelty, fatalities and long term behaviour problems. The illegal setting off and selling/purchasing of fireworks is handled by the SAP (Police officers) and the noise, disturbance and letting off is handled by the municipal law enforcement (Peace officers) as this falls under the Municipal by laws. The person in charge of the enforcement dept is a Mr Armstrong 023 626 8200 or you can call the call centre at anytime 023 615 8000/3037 or after hours and weekends should you not be able to contact the call centre then the standby traffic unit can respond and enforce 084 601 6462. Please lets make a concerted effort to stop the illegal use and selling of fireworks in the village before it becomes out of hand. A message to all “Friends of CARE”. Thank you all for your support during the past year. out by the “Werdmuller Animal Rescue” (W.A.R.) organisation. ​should you wish to collect your Friends of C.A.R.E 2018 calendar. Thank you once again and best wishes for the forthcoming year. 19 July 2017 at How Bazaar, 44 Voortrekker Street, McGregor at 5.30 p.m. Thank you to all who contributed to this worthy cause. collars and leads - any sizes - many children are walking their dogs but can't afford leads and collars. dog bedding, baskets, kennels, food and water bowls. Del will give it to the people who look after their animals but can't afford the above. monthly or one-off donations of Montego dog / cat food - Del sells it at the Saturday morning clinic (a small fundraiser) and gives it to the animals in need of food. Friends of C.A.R.E Calendars available for sale at R40 at Saturday Morning Market - at Marlen's book stall. Money raised from booksales - any donation of good quality, second-hand books welcome - contact Marlen at 079 086 1558 or deliver at 56 Voortrekker Street or at Morning Market. Please note new banking details above. ​MySchool MyVillage MyPlanet - how can we grow our funds? Every swipe counts for Friends of C.A.R.E. 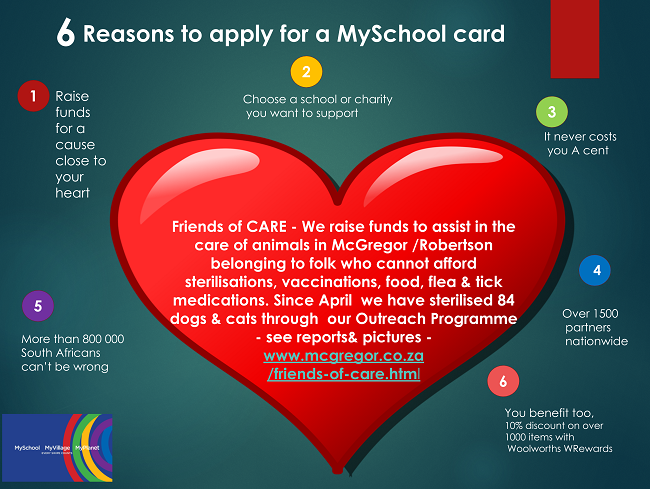 Exciting news is that Friends of CARE has been accepted as a registered animal charity which will benefit from all purchases made at outlets honouring the My School, My Village, My Planet card initiated by Woolworths. It costs card-holders nothing. So please fill in a form at your nearest Woolworths, and help CARE to care. We get a very small proportion of the "spend", but every little helps and it does mount up. Three beneficiaries are allowed on each card, so if you already have a card, please consider adding CARE. Our registered number with My School is 11546. In the Robertson/McGregor area, the card is honoured by the Robertson nursery, the cafe at Rooiberg, Jack's Paint & Hardware (at AH Marais), Supa Quick and The Lemon Tree House. In centres like Johannesburg and Cape Town, of course, the scope is far wider. Do please take the five minutes to "sign on" at the store, or download an application form from https://www.myschool.co.za/supporter/apply and e-mail it back. You really can make a difference ... and benefit from Woolworths' own special offers in the process. With a woof, miaoux, moo, cluck and grunt of appreciation from all our animals.